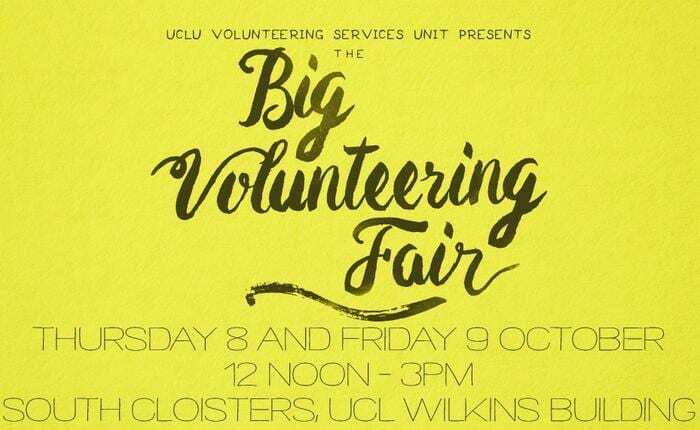 UCLU’s Big Volunteering Fair is here! Come along to our Big Volunteering Fair on the 8th and 9th October and find out why over 2000 UCL students took part in volunteering last year. Organised by UCLU’s Volunteering Services Unit, There will be more than 80 different charities and student-run community projects to have a chat with, including Save the Children, UCL Student Hospital Fun Team, Bloomsbury Festival, IntoUniversity, NSPCC, St John’s Ambulance, Camden LGBT Forum, The Conservation Volunteers, Teenage Cancer Trust, Generating Genius, Mayhew Animal Home, The Hackney Pirates, University College Hospital London, Handel House Museum, London Nightline, UCLU MEDucate, Richard House Children’s Hospice, UCL Baking Project, The Science Museum and more! Volunteering is a big part of student life at UCL; it’s a good way to get to know London better, meet new people, and experience the world away from the lecture theatres, labs and libraries. You’ll also boost your chances of finding paid work. We hope to see you at the Fair.